One of the interesting things about Revit is that you will frequently encounter various methods and workflows of accomplishing the same task. This is particularly true of Shared Coordinates. Since posting about the Survey Point in March, I have started to use a slightly different and potentially more efficient method of establishing coordinates. This is an update to the previous post. 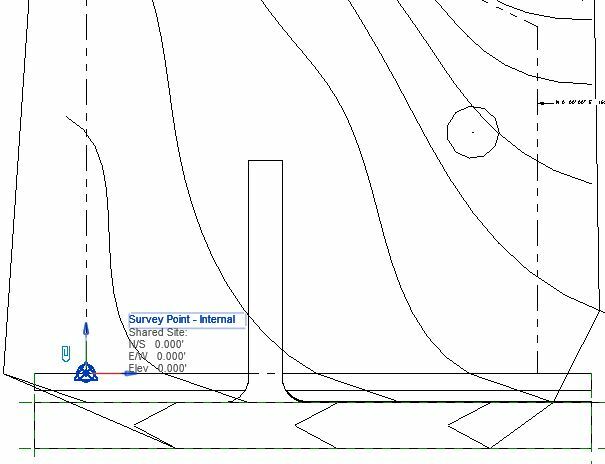 If using a CAD survey, link in the survey and move the survey so that the Project Base Point is within the survey boundary. Often, it is a good idea to place the survey so that the Base Point is on a known project benchmark or a node with specific coordinates. For simplicity, I often keep my Project Base Point and Survey Point at the same location (x,y or in plan). By default, both points will initially be in the same place. Before modifying the coordinates, the Survey Point must be unclipped (click on the paperclip), otherwise it will keep its current coordinates (I have also turned off the Project Base Point, for clarity). 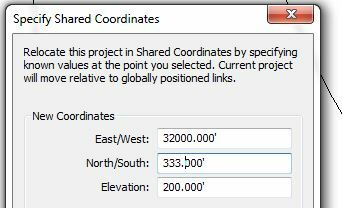 Now, instead of changing its coordinates manually, use Specify Coordinates at Point (under Coordinates, on the Manage ribbon). First, you will be prompted to select a point. This is easiest to do if there are actual model elements drawn into the Survey Point (such as a Property Line). If you do not yet have anything at the Survey Point, I would suggest drawing a Model line for temporary snapping purposes. The Specify Shared Coordinates dialogue box will then come up. After entering the corresponding Northing, Easting, and Elevation information, the Survey Point will now have the correct, real-world coordinates. Select the Survey Point and reclip it. At this point, it is always a good idea to double-check the coordinates data, to make sure you snapped to the correct point. It can then be pinned down and exported to dwg. Just make sure the coordinate system in the dwg export settings is correctly set to Shared and check your DWG Export Settings.